In early 1974, my grandfather died and his farm truck, a 1960 VW SC, was put away into a storage shed on the family farm in North Dakota. In the summer of 1988, after not seeing the truck since I was seven years old, I went up to the farm and pulled the SC out of the shed. With the help of my Great Uncle Norman, we were able to get it running. After replacing a couple seals, putting in a new battery and buying two new front tires I then, as a foolish 22-year old, drove it from North Dakota to Albuquerque, New Mexico. I used the SC for that summer--although it never ran right -- but when I came back to NM the following summer after graduating from college it wouldn’t start. Two years later, before I left for an Air Force assignment in Saudi Arabia, I had the SC towed to a storage lot, where it remained until 2009 when I retired from the Air Force. That summer I trailered it from the storage lot to my parent’s garage. It sat there until 2014 when I finally was able to retrieve it and bring it back to our new home in the West Virginia Panhandle. Several people stopped by to ask about it, and one said if I intended to restore it I had to give Cookers a call. Another year passed, and finally in the summer of 2015 I called Bob and Gene and we made arrangements for a “patina restoration”, asking them to save as much of the original paint as possible, but giving them permission to, perhaps, go a bit “overboard” on the engine, interior, wheels and tires. The crew at Cookers did a phenomenal job at repairing the rust damage and then blending in the new paint to seamlessly match the existing. The SC looks very honest to its history as a farm truck while being a modern ride. Everything Cookers’ did was top notch and exactly how I envisioned it. Bob and Gene kept me in the loop and ensured I was consulted on every detail. They did a great job photographing every step of the process. I was able to stop by every so often over the 10 month restoration to meet with them and the crew; the shop is manned by a very hard working group who truly love what they do. They eat, breathe, and sleep aircooled VWs. The SC was unveiled at Cookers’ 2016 Open House and then the next day I drove it to the Simple Transport 9 show in Hagerstown, MD. After waiting 28 years it was great to finally get to drive it again. While I’m not a VW “guy” per se, we have already talked about another air-cooled VW project at some point down the road. Thanks to Bob and Gene and the entire crew at Cookers for bringing my family’s farm truck back to life. The first time I ever went to Cooker's, I had them redo my bugs seats and boy was I impressed. Very nice people and they do amazing work! Then I took them my 1961 VW Double Cab for metal work and after seeing the job that they did on it, I'm under the impression that there isn't anything that they can't fix! I'd recommend these guy to anyone! In May of 1996 a friend told me his sister’s landlord was going to have an old VW bus hauled away for scrap down in Virginia, and we should check it out. We took it as an excuse for a family day trip, and found a later model splittie mired in the mud and decaying oak leaves of a forest. It had been there for 19 years. But we thought it could be saved, more important felt it should be saved, and after a few weeks of negotiation paid $25.00 on a bill of sale, towed it out of the woods with my Vanagon Syncro, and had it hauled to a sympathetic neighbor's garage. Then life intervened. A big move, a long family illness, college bills. Another nineteen years passed when last winter I got a call: the neighbor was moving, I had to get the bus out. One thing led to another, I called AAA and had it delivered for evaluation to Cooker’s, a place I’d never seen and people I’d never met, but they had a great reputation. I figured they would likely recommend parting it out or selling it outright. Either result was fine with me, I’d been the caretaker for almost two decades and one way or the other the bus would live on. Then a funny thing happened. I went out to my HS reunion, where I had a most remarkable ride with a friend who had restored a ’29 Model “A" Ford truck back in those days. He brought another “A"to the party, and we snuck out and went for a great drive. For me it was the highlight of the reunion. Coming back on I-70, I decided to see the bus one more time, and stopped in at Cooker’s unannounced. I pulled up and the bus was in front, and I saw once more the damage to the rockers and the underbody all those acidic leaves had done, the bashed in front, it was forlorn. But Bob and Gene showed me the other side of the coin: the original paint still shined up, besides the nose it was really pretty straight all around, the dash was pristine, and much of the Como green interior, including the rare Ice Blue headliner was intact. Clearly this bus could be saved, which was the original thought of my family almost 20 years earlier. Inspired by my ride in my old friend’s Ford, I really looked forward driving this bus, putting it back on the street. We agreed to do a patina restoration to stock. All structural metal problems were addressed, with the new metal blended into the original finish. A fresh engine was sourced, brakes, suspension, trans was rebuilt, she got a new wiring loom and was converted to 12 volts. That beautiful, unusual original headliner was carefully, painstakingly cleaned. My guess is that 80% of the interior and exterior are original, including the 51 years of patina. But that is just the big picture. The team’s attention to detail was amazing, the work beautifully, painstakingly and carefully done. I was consulted frequently about many small decisions we needed to make as we went along. Everything was photographed every step of the way, and I was able to get up to the shop to visit about once a month. Progress was incredible; this is a very hard working, professional shop and everyone loves what they are doing. Six months later the maiden voyage - I actually drove my bus 75 miles back home, and had a smile on my face the whole way; "Sage" is not a trailer queen. Off the highway for over three decades, I’m sure from here on out this bus will always have caretakers that will treasure it. And that makes me feel great. As a final testimonial to Cooker’s, I’ve already asked to have another project put into the que. What is behind my Garage Door #2? I'll let that be a surprise for later, but I will say its very different, and yet the same. Thanks to the Cooker’s team! In August 1979, I purchased 2 VW Beetles for $440.00, a 1964 and a 1969. I brought them home and began tearing them apart, then scrapped the ‘69 rust bucket and put that motor in the ‘64. The process of restoring began-my boyfriend (now husband) and I did a lot of the work on the car. We did all the mechanical and interior work. A close family friend that worked for a body shop agreed to do body work and paint the car. After much work on the car, I finally got the car on the road. I had taken it to Maple Grove show and others. Years went by-college, marriage, children and the VW was “pushed to the side”. I remained friends with my friend Mike (body man/painter) and he would occasionally ask me to sell him the car. He was always looking for vehicles to restore and then would resell them. After years of being asked to sell the car, I finally agreed to sell it to him April 1998. I sold him the car for $600.00. In July of that same year Mike became very sick and was only given 5% chance of surviving. After months in the hospital, he was finally released. He would apologize to me over and over for not being able to finish the car. I accepted that-as long as my friend was ok. The car remained in a garage for the next 2.5 years. In February of 2001 my friends health began to deteriorate rapidly, he continued to tell me (with tears in his eyes) he was unable to finish the car. On August 30, 2001 (my wedding anniversary) Mike passed away. About 1 month later his son contacted me and told me that his father had told him that I was to have first choice of buying back the car. I was told the cost would be $2400.00, I agreed immediately as the car had so much sentimental value to me. Within 2 months we went to the garage, collected the car and parts and trailered it home in pieces. We eventually purchased a trailer for the car and parts. The car sat for the next several years. Even with the car in pieces my family and I always attended VW shows-Maple Grove and Bug-Outs in Virginia, just to name a few. One year at the Bug-Out my husband and I admired the exceptional work of the VW’s that Cooker’s Restoration had on display. At that time we met Bob Cook of Cooker’s Restoration. We spoke to him, found him to be very approachable and extremely knowledgeable and told him our story-that we were looking to have the “64 restored. He gave us his card and we said we would be in touch. Years went by but we continued to attend car shows and continued to see Bob and always promised to be in touch. In 2013 we met again and again told him we would be in touch to start the restoration. Finally, on Wednesday, August 21, 2013 we trailered the car to Cooker’s. At that time we met with Bob and his crew. They were all extremely attentive in the car, our intentions of the restoration and history as well. As we left the car that day-I felt a sense of deep sadness but happiness at the same time. I would finally be getting my car restored! Over the next 2 years I have traveled to Cooker’s numerous times-making decisions and checking on the progress of the car. Each and every time Bob and his crew have been nothing but easy-going and patient. Bob made suggestions when I was unsure of decisions and made my suggestions a reality. In 2015 I traveled to Cooker’s several times, the car was just about complete-except for the motor due to the cost. I knew it was a large expense because of my husbands’ decision to install a roll-cage-due to the fact that the motor would not be stock. Realizing this, I did not expect to get the car back until early 2016. On August 11, Bob contacted me stating he was having an Open House at the shop and would like to display my car, even though it would not have a motor. I agreed and said we would see him on the 21st. I was definitely looking forward to the Open House, as I had not been to see the car in several months. The Open House was scheduled to begin at 2:00-we did not leave NJ until 1:30 and being it is a 3.5 hour drive, I was not happy leaving that late. I had mentioned it was not worth going so late as I felt no one would be there. My husband reminded me Cooker’s puts many late night hours and the Open House would be no different. As we approached Cooker’s shop I saw my car across the street from the shop but assumed Bob decided not to display the car after all. I was ok with that-I was still happy to be at the Open House and anxious to see all the cars and buses. A little while after we arrived out of the corner of my eye I was shocked to see my car being driven into the lot! The shock of that was unbelievable!! Without my knowledge my husband had been meeting with Bob and arranged to have the car completed for my 29th wedding anniversary and on the 14th anniversary of Mike’s passing. As I am writing this I still cannot believe the car is completely restored-Thanks to my husband Michael and the entire Cooker’s crew-Words cannot express my gratitude and appreciation!! advised that he needed a few months before I could leave it there for work to begin. I delivered the bug to his shop the first week of June 2014 to begin work. My proximity to the shop allowed me to drop in frequently (and unannounced) to check on progress and make design decisions. I was always made to feel welcome while there. I’ve worked in design, construction, and manufacturing for many years, so I have a firm understanding of how messy fabrication shops can be. I also grasp the blurred lines of budgeting, lead-times, and unforeseen issues that can pop up last minute. Cooker’s shop is one of the most organized I’ve ever been in. Bob and his brother, Gene, never made promises that they could not keep with respect to delivery timelines. They made sure to get my explicit approval on every design decision that affected the bottom line/final invoice. At every turn, it was clear to me that they respect their clients’ choice to bring our classic VWs to Cooker’s. They are also completely devoted to their chosen craft, and without hesitation will take whatever steps possible to make something the right way. Bob has a keen grasp on the balance between correct fitment, age-appropriate aesthetics, budget-friendly decisions, modern taste/style, and mechanics to make it all run. paperwork it takes to run a business as an administrator, and as a personnel manager. Through extensive conversations, I trust Bob’s judgement as an administrator and small business owner in the state of Maryland. Through first-hand observation, I can see that he is also an effective manager of his staff. He assigns tasks to the member with the best skill, and still finds time to make teachable moments where there is room for improvement within his staff. Again, this speaks to the juggle any business owner has on a daily basis to get product out the door, revenue in the door, and keep the people (customers AND staff) who make it all happen happy. I took delivery of my finished VW in November of 2014. Cooker’s completed more volume of work in 6 months, than 2 other shops could manage in 3 years. They finished it faster than I was expecting, and the final invoice was exactly where I had budgeted. There were no surprises or unexplained charges on my final bill. The fit and finish of my car is exquisite. Owning a vintage/classic car guarantees that there will be ongoing service work. The relationship I’ve built with Cooker’s Restoration is strong, and I am confident that Bob and his crew will keep my classic car road worthy for a very long time to come. I just wanted to send you a note to let you know how pleased I am with the two restoration projects that you have done for me. The 1962 VW single cab turned out much nice than I had envisioned and the 1956 VW oval rag top was done with show winning detail. The professionalism and detail that you show comes out loud and clear in the finished project. I’m looking forward in getting started on the next project with your organization, maybe the 1951 VW split window. I know that you are busy so put me on your calendar for the near future. I have been watching you on Facebook and you are building very nice cars and buses! I am glad that I found you back 2008 to do my 52 VW Zwitter. The first show we went to we took a prize and have had several more at other shows. It is amazing how you took my old car, replaced all the rust with new sheet metal and kept the frame straight like it was originally built. The interior came out nice. I do not know at how many shows I get compliments on the paint job! I know when we brought it home it was like a mirror, in fact Hot VW's had trouble shooting it for their magazine because the photographer could see himself and everybody else, and the paint is still something admired at shows. I can't say enough about your work, but I do know there are not many people able to do the job you do. In 1987 I purchased an old but running 1963 Volkswagen Beetle car with more rust than any car I had seen before and an engine taking its last breath. If it was raining, the passengers would get wet. Doors would sometimes refuse to open. It was a neat car, however, so I kept it. 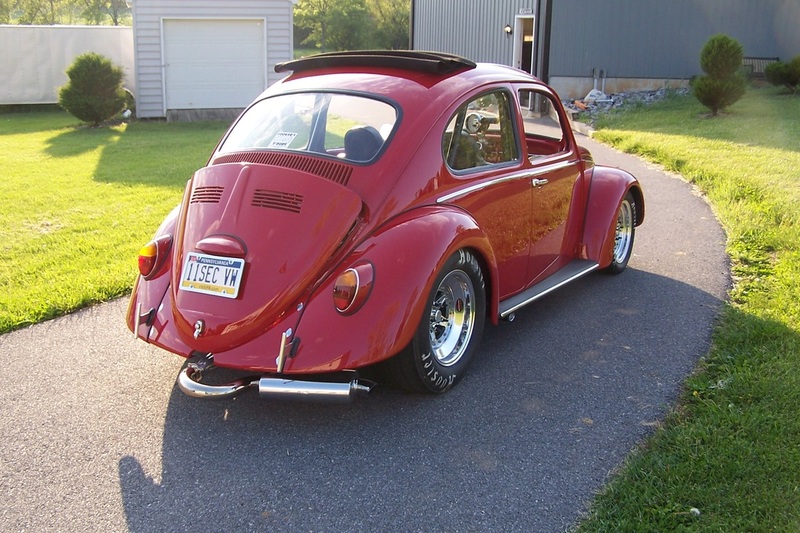 In the summer of 2012, I searched for a Volkswagen restoration shop to bring the old car back to new condition, and I eventually selected Cooker’s Restoration and Fabrication, LLC. 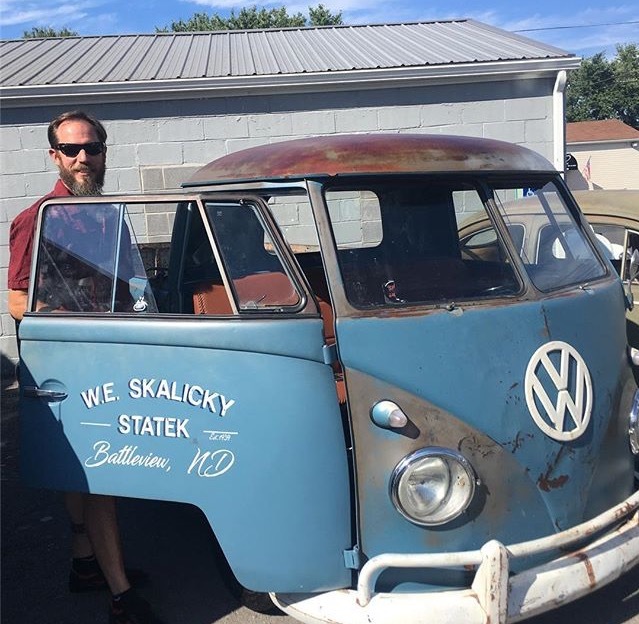 I was so happy with the results of their work that I purchased a 1957 Volkswagen Bus they restored, and I sent them my 1965 Volkswagen Beetle I have owned since 1985 for restoration and custom modifications. I recommend Cooker’s Restoration and Fabrication, LLC, for their quality work, extensive product knowledge, and fair business practices. The work quality is exceptional. I spent years working on my cars as a hobby in my spare time, but I never gained the skills to come near to the metal repair work on my 1963 car. The panels fit so well they show no sign of repair. Welds have full penetration with minimum inclusions so they are as strong as original. I only expected a restored car, but I received a car fit to enter car show competitions. The restoration details extend inside and even underneath the car. Much of my car was beyond saving, but only original or quality reproduction parts replaced what couldn’t be salvaged. My car was restored to a stock factory condition as I wanted, and I noticed the shop typically maintains the original nature of their customers’ cars. Exterior vehicle modifications are rare, and the cars maintain the same drive train and suspension sometimes modified for higher performance. That’s the style of restoration that seems best for older cars so few in number. Restoration quality is only possible if the team knows their business. The Cooker’s staff has impressive product knowledge, and they are happy to share it. During one of my visits, we discussed exterior and interior features specific to 1963 but different between European and US specifications vehicles. The team is involved with the vintage Volkswagen restoration and racing industries. They participate in car shows and drag races, contribute to industry websites, and collaborate with vendors and other restoration businesses. Their industry involvement keeps them current on products and practices. I was impressed with their knowledge of past and current industry trends. Since I was involved with vintage Volkswagens in the 1980s, I can testify what we were doing then. I often reminisce with the staff what we were doing 30 years ago, and they teach me what has changed and why. That helps me understand the advantages between different choices without influencing my style preferences. Some choices are technically equal but aesthetically far apart. I notice and am glad the staff avoids influencing my style choices. For example, when I decided I wanted to try white wall tires, nobody encouraged or discouraged my choice. Besides quality work and product knowledge, the most important value to me from any restoration business is to be treated fairly and with respect. Vintage automobile restoration work is complex and dynamic. Every car is unique. Cooker’s Restoration and Fabrication, LLC, executes fair business practices by frequently sharing information with customers. They use social media to share progress. I can’t frequently visit their shop, but I could still see my car progressing on Instagram. If a problem or question surfaced, the staff sent me text messages so I could interact without interrupting my day. I asked for a change very late on a completed panel. The change required repeating body work and paint that was done, and I was thankful nobody expressed frustration over repeating work. Cooker’s Restoration and Fabrication, LLC, produces quality restorations true to the original nature of the Volkswagen vintage cars. They have impressive product knowledgeable and are happy to share with customers. The business is fair and keeps customers well informed of progress, questions, and concerns. In an industry with few options, I am fortunate to have found Cooker’s Restoration and Fabrication, LLC, and highly recommend them. I am writing to express my extreme satisfaction with Cooker’s Restoration and Fabrication. I first learned of Robert Cook and his crew from seeing examples of his work in numerous issues of HotVWs Magazine. 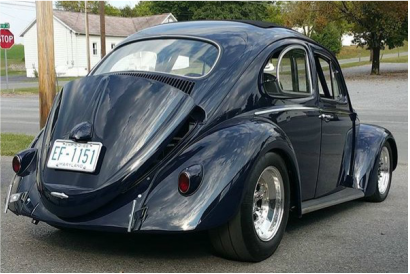 I had a 1968 Beetle sitting in my garage for over 30 years and was considering selling it since I had never gotten around to turning it into the dream car of my youth. I decided to call Bob and ask if I could visit his shop to help me decide if I should sell my car or let Cooker’s do a complete restoration. Bob responded that I should stop by his shop and take a look at his some of his projects underway. When I arrived Bob showed me around and shared the story on each car under construction. Little did he know but I was in awe of every car he showed me. The craftsmanship and finish on each car in progress was impeccable. I knew at that moment I needed to have Cooker’s take my car and turn it into the dream car I had imagined for the 30 years it sat in my garage, a restoration beyond anything I could ever dream of doing on my own. When it was time to talk about my ideas for my car, Bob and I sat down and talked. As I spoke, Bob took notes and made suggestions along the way. I knew Bob was a craftsman at creating show quality cars so I told him the basics of what I wanted but also told him to feel free to incorporate his own ideas along the way. When my car was delivered to Bob’s shop it was immediately and completely disassembled and each part was inspected by his expert crew. I was able to follow along as the car was taken apart and inspected as Bob and his crew posted photo updates of their work on Instagram. As the car was reassembled each part was either refurbished or replaced. When the car was originally delivered to Cooker’s it was accompanied by a 30 year accumulation of parts I had hoped might be incorporated in the restoration. Once the reassembly began Bob contacted me with new ideas and suggestions regarding the parts I had provided. His ideas and suggestions always recognized my desire to build the car I had always wanted but once I heard Bob's suggestions I knew his ideas were far better than my own. The greatest pleasure I have in the finished car is that Bob was able to able to see the vision of my dream and make it better. I believe that is the artistry of Bob and the crew at Cooker’s. All along the restoration process I could see that Bob and his crew were just as excited about my car as I was. Individual bolts were hand polished. Custom bodywork was completed, so good it goes unnoticed to an untrained eye. Electrical wiring so flawless, each wire tie equal distant to the next. When I insisted that Bob deliver the car with a deck lid that closed atop a set of Weber 48 IDA carburetors he found a way to make it work. As the car got closer to being completed Bob stopped posting pictures for a ‘big reveal’ of the finished product. This convinced me I needed to prepare for a car beyond anything I had hoped for. Finally Bob told me I could come to see my car as it was almost complete. When I arrived at Cooker’s the car was everything I had ever dreamed of owning, far beyond anything I could have ever accomplished on my own. I could see the finished car would truly be show car worthy, a car not unlike every high end car I had ever seen before knowing I could never create on my own. When Bob told me the car needed gas and I should drive it to a nearby gas station and fill it up I was without words. I knew the car was almost complete but I had no idea I would have the opportunity to drive it on this visit. I had waited 30 years for this moment. I cannot describe the feeling I had at that moment. Bob seemed as excited as I was. I told Bob I felt the car belonged to both of us. The car was completed and immediately taken to the ’No Dough' VW car show in Florida where it was awarded ‘Best of Show’. The car was photographed by Dean Kirsten of HotVWs for inclusion in an upcoming issue. The dreams of my youth were fulfilled beyond anything I had ever imagined. I had a show worthy car, the car had placed in a major show and would appear in the magazine of my youth. Robert Cook and the entire crew at Cooker’s Restoration and Fabrication had not only fulfilled my dream of having the car of my youth, they had taken the dream beyond anything I had ever imagined. I will forever be indebted to everyone at Cooker’s for what they have done for me. I continue to be in contact with Bob and the crew at Cooker's. I look forward to showing my car at VW events along side all the other show quality cars Bob and Cooker’s have created for others. Each and every car out of Bob’s shop is a flawless expression of Bob and his crew’s artistry and skill. I highly recommend Cooker’s and can say I am a proud owner of a Cooker’s creation. I have known Bob Cook, owner of Cooker's Restoration and Fabrication for many years. I have found working with Bob Cook and his crew to be very consistent with the best quality of work that I expect. Tackling all of my personal Volkswagen restorations with passion and dedication. 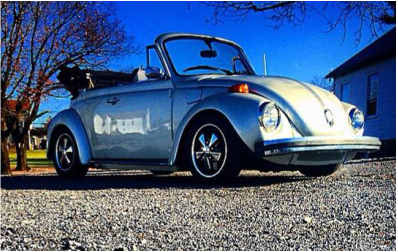 Bob Cook is a take charge person who presents great ideas with expertise in Volkswagen restoration. I am an out of state client and doing top level builds, I have found Bob Cook to be honest, up front and accommodating with restoration fees, texting pictures and posting pictures on Instagram, as work is being accomplished. I highly recommend Cooker's Restoration and Fabrication for any Volkswagen restoration. In 2010 I contacted Bob Cook to do the metal, body and paint work on our 1967 Volkswagen bus. I was very pleased to have the work completed just before the date that was projected. Bob obviously is familiar with metal and body work, especially concerning Volkswagens. The bus was beautifully painted with all the metal properly fixed as original. The Velvet Green paint matched perfectly. Bob often teased... "you won't bring yourself to take this beautiful bus camping". We camped (a bit timid at first) and after 4 years of camping, the bus still looks great. It is no secret that Volkswagens have increased in value. We are very pleased with our investment and the work we had done at Cookers. If you want to have your Volkswagen restored correctly, I recommend Cooker's Restoration. Too often, people are quick to complain and remain silent when praise is due. Therefore, I wanted to take the this opportunity to let you know how pleased I am with my beetle! I couldn't be happier. Cooker's Restoration & Fabrication does great work! I would recommend Cooker's to anyone that wants quality work with pride. Your team is meticulous and works tirelessly to provide the end result that constantly exceeded my expectations. This kind of pride is difficult to find any more. When we started this restoration together, I just wanted to fix it up enough to run it around town. Cooker's had higher expectations and made my car the best looking car around town. The car, inside and out, from the engine to the roll bar, to the paint and custom car wing, looks fabulous! The quality of your work is impeccable. Your attention to detail is faultless. The Cooker team, obviously, really cares about their customers. You're highly motivated and very proud of your work! I've known Bob Cook for over 10 years. He has more than proven himself to be honest, dedicated and extremely hard working. He is dedicated and diligent with each project conveying the highest integrity and commitment. Cooker's is a hard working, top performing restoration and fabrication industry leader. I continue to search for projects that I can send to Cooker's. For outstanding level of service, enthusiastic devotion for the highest quality and a top-performing team, I suggest taking your car to Cooker's Restoration & Fabrication. You have my highest recommendation! Thank you Cooker's for your unwavering commitment! A follow up note from your work on my '63 double cab 5 years ago. It's been a while but it took me a while to finish building the engine and shaking it down. Seeing you at the BugOut in VA last weekend reminded me to send the note. Thanks for the outstanding job on the bus and standing behind the work to redo the work after a couple of years. The bus still looks great and I've pulled awards in 8 of 9 VW shows I've attended and a few parades. This is a pretty strong recommendation as the bus is a driver and unlike a lot of restorations actually sits under cover outside some of the time. I got first in Trucks at the Bug out, and my bus was one of the few that drove 350 miles to and from the show that weekend. I love the fact it's not a trailer queen, driven regularly, and hauls stuff when needed. I came to your shop for your reputation, and the work performed made it all worth while. We both have owned a lot of VW's but yours is the first shop that really knew the bus and the work involved. It was great to work with you and your crew to make critical decisions on what to repair and replace after we removed 7 layers of paint and 45 years of abuse from the pickup. Once the paint was stripped we saw all the ugly. The truck looked Ok going into the shop, the the product coming out is totally solid, with all the weld work perfect. Worth the effort, wait, and cost. I only wanted to do it once. Enough said. Keep cranking out the buses, but make sure you don't do too many trucks, so I can still take home some hardware from the shows. I have known Robert Cook and have been doing business with Cooker's Restoration & Fabrication, LLC for the past ten years. In that time, he has restored, rebuilt or repainted six or seven vehicles for me. He has performed services for me as simple as a tune-up to a full body restoration. I have trusted Cooker's with hundreds of thousand dollar projects and will continue to trust and do business with him in the future. He treats every vehicle of mine like it were his own. I highly recommend Cooker's Restoration & Fabrication, LLC as a company and Robert Cook as an honest person. Cooker's Restoration & Fabrication recently completed a total rotisserie restoration of my 1967 Deluxe 21 Window Volkswagen Bus, a vehicle that I have owned for more than 25 years. When I decided to have it restored, it was important to me to have the work done by the best restoration shop I could find. After seeing multiple examples of their work, I contacted Bob Cook and was immediately impressed by his knowledge of vintage Volkswagens and his passion for restoring them to a high level. After careful consideration, I determined that Cooker's was my best option to restore the bus. This vehicle, frankly, was in very rough condition and needed extensive rust removal and metal replacement. Every square inch of the vehicle was stripped to bare metal and the body worked extensively to ensure that it was solid, straight and completely rust free. The entire bus was then primed and painted inside and out to its original two-tone color scheme. Additionally, the front, middle and rear seats were stripped of their upholstery, the frames sand blasted, then painted and reupholstered to match the original seating. The headliner and sunroof cover were also replaced using correct materials. The engine and transmission were rebuilt and refinished to like-new condition and the wiring harness was completely replaced. Reassembly of the vehicle was complicated and time consuming. All windows (21 of them) were reinstalled utilizing new glass when necessary. All windows and door openings received new rubber seals. The entire restoration took approximately 18 months. Throughout the process, I was in constant contact with Bob Cook and his crew and was kept apprised of every step of the restoration from beginning to end. I also visited the shop frequently and was thoroughly impressed by their work ethic, their expertise and their attention to detail with my project as well as others. The end result was a period correct, showroom condition vehicle that far exceeded my expectations. Days after it was completed, we took the bus to one of the largest Volkswagen shows on the East coast where it one two prestigious awards. A few weeks later, it was featured in Hot VW's Magazine, a national publication that caters to Volkswagen enthusiasts. Cooker's made my 25 year dream of a beautifully restored vintage Volkswagen a reality. I would work with Bob Cook and his crew on another restoration in a heartbeat. I would recommend Cooker's without hesitation to anyone in need of a professional, knowledgeable shop with the capability of producing restored vehicles of unparalleled quality. I would whole hardly recommend Cooker's Restoration for any Volkswagen restoration. We were very pleased with the work that was completed on our 1981 Volkswagen Vanagon. The care and attention to detail regarding the paint, the decal and the interior was superb. The customer service was exemplary, and I would not hesitate to recommend them to anyone in need of a Volkswagen restoration.